Google Plus Hangouts is a group video conferencing service, with features that can match professional video conferencing solutions. Starting a Hangout is easy and free! with Google+ account. After installating supporting software place your webcam proper position and check the audio inputs up to 10 different users or groups of individuals at one location can join the hangout and multi video chat and collaborate. Be in 10 Places at the Same Time, one can invite up to nine additional classes or individuals to participate in the class— perfect for multi-campus institutes where there is perhaps only one teacher for a specialized discipline but a few students in various campuses interested in learning, or for that matter for sick or travelling students who are not able to attend the class. Or for guest lectures, for that matter—it might be cost-prohibitive for small schools to bring in experts for in-person lectures, but just about anyone can ask to connect with an expert over Hangouts, bringing a valuable resource into the classroom. Collaborative Research/ Projects/Events: If you have the need to collaborate or brainstorm with a set of non-residential students around an event or research study after hours, why make them stay on campus when they can easily join the discussion from their own homes? Better still, this is a perfect way to invite a subject matter expert to participate in the discussions without the pain of travelling. What’s more, Google now allows users to add and create docs in Google Hangouts, making it easy to collaboratively edit documents right in the middle of a Hangout! Campus Previews: Using pre-scheduled Hangouts, admissions counselors can chat with students and discuss what it’s like to attend their college or university. Using the power of smartphones and wireless networks, what’s to prevent your admissions department from conducting a live virtual tour for prospective or confirmed students? Recruitment Chats: The bane of campus placement cells is companies from across the country unwilling to travel on campus. 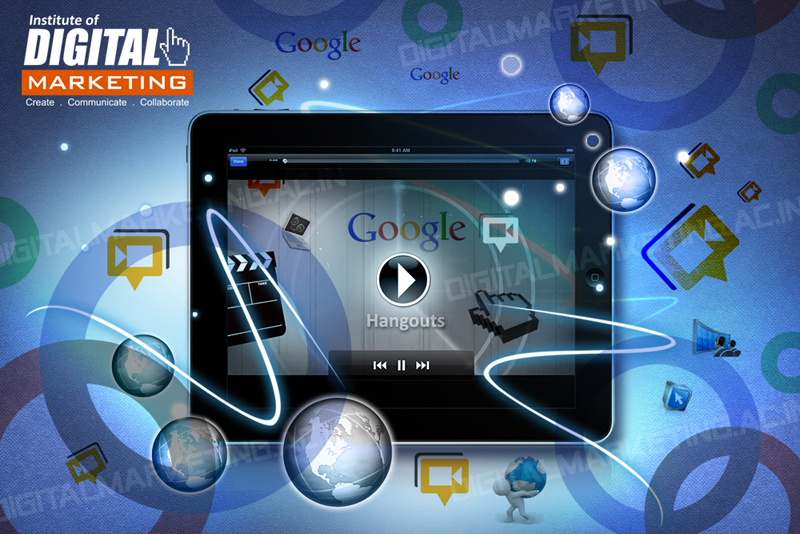 With Google+ Hangouts, placement departments can set up virtual college job fair, offering Q&A sessions for the admissions process and even highlighting important people on campus like department chairs, and going further, allow for interviews of shortlisted candidates by company personnel without stepping out of their offices! Virtual Office Hours: As an educator, it can be difficult to schedule face to face time with all your students on campus, but with Hangouts, teachers can designate a time to address individual or class questions and concerns in a once-a-week post-hours session. These can be extended to help sessions to assist students who may need a little extra support in grasping specific nuances of a subject. Review Lectures: If your educators regularly post their teaching videos on YouTube, they can integrate them into a Hangout, and allow the audience to simply re-watch your lecture within the Hangout, pausing for re-teaching or re-emphasizing a specific point. Career Spotlights: Do you have a close relationship with your students’ parents? You can invite parents who are in particular industries of interest to log on onto a Hangout and host a career spotlight explaining what working in their industries entails. An industry outreach programme with the corporate sector, possibly with alumni placed successfully in these sectors, can achieve the same. Recent graduates can connect with current students through Hangouts, offering personal chats on what life is like after graduation and the specific areas of development for the current batches to be better prepared to address the needs of the industry.